Anginares or agginares à la polita is a dish originating from Constantinople, in Greek Constantinoupolis, also called “Polis” meaning the city of Constantine. Therefore this dish means “artichokes city-style”. Asia Minor used to be Greek for millenia until the Turkish Empire captured those territories as well. The Greeks developed several styles of cooking such as Smyrneiki Kouzina or Politiki Kouzina, the former from Smyrna and the latter from “Polis” and “Anginares à la polita is one of the most known dish of “politiki kouzina”. This is a delicious and healthy Lenten dish which can be served either as a side dish but we eat it as a main dish as the addition of potatoes makes it quite filling on its own. 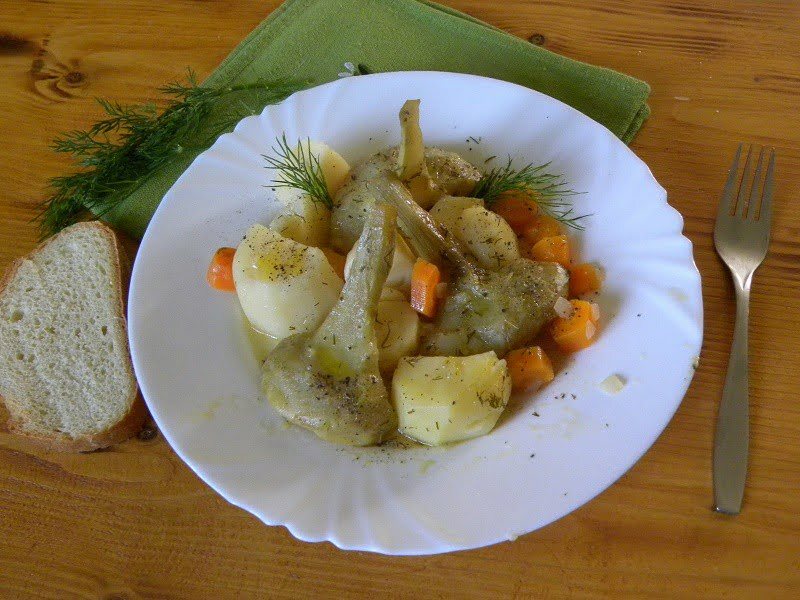 This wonderful, aromatic dish is a harbinger of spring and makes good use of artichokes, of one of the first spring vegetables in the market after a long winter. You can use fresh or frozen artichokes to make this dish and apart of the fussy part of cleaning the artichokes, the rest is very easy. In Greece we have some aromatic herbs called Kafkalithres and Myronia, which I love using in this recipe, when they are in season. Sometimes, I also add some peas as well. Have you ever seen fields of artichokes? On a recent trip to Nafplion we visited the villages of Drepano, Vivari, Candia and Iria. The two latter villages produce 90% of Greek production of artichokes. We could only see acres after acres of artichokes fields in the region. On our way back, we bought some artichokes, in order to make this delicious dish again! Anginares à la polita is a dish originating from Constantinople, in Greek Constantinoupolis, also called "Polis" meaning the city of Constantine. Therefore this dish means "artichokes city-style". Peel the artichokes and put them in a bowl with water and lemon juice. In a saucepan heat the olive oil and sauté the onion and the white part of spring onions for 3 to 4 minutes. Add the green part and garlic and sauté for a few minutes until translucent. Add the artichokes, potatoes and carrots and mix. Add salt and pepper and add the bay leaf and water. Remove the bay leaf after 15 minutes. Dissolve the corn flour with the lemon juice. Add a little broth from the food, stir and pour over the food. Add the parsley and dill and cook for 5 more minutes. Artichokes are also grown here in the countryside. That dish looks really good! This dish is a herald of spring, with its lightness and the fresh herbs! Truly unique. It looks very fresh and healthy! I want to thank you for sharing such good recipe with us.